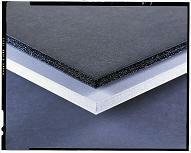 Foam Core Board → White Foam Board → BAINBRIDGE® Smooth Mount Foam Core Board 1/4"
Ideal for digital prints. Digital prints are thinner and more fragile than original artwork and the slightest orange peel effect can be obvious. Bainbridge Smooth Mount foam core board is the ideal choice for mounting digital image prints that demand smoother, more rigid mounting substrates. This foam board features an ultra smooth surface, a harder feel, greater rigidity, and is available exclusively in 1/4" thickness. Sold in cartons only. 20/shts per carton. FREE SHIPPING!